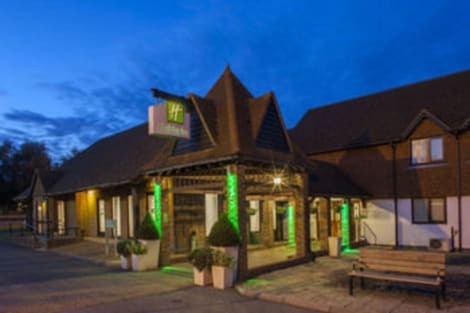 Located in Ashford, The George Hotel is minutes from Ashford Museum and close to Ashford Designer Outlet Located in Ashford, The George Hotel is minutes from Ashford Museum and close to Ashford Designer Outlet. This inn is within close proximity of Willesborough Windmill and Ashford Golf Club.Rooms Make yourself at home in one of the 2 guestrooms. Conveniences include coffee/tea makers and irons/ironing boards. Make use of convenient amenities, which include tour/ticket assistance and barbecue grills.Dining Enjoy a satisfying meal at a restaurant serving guests of The George Hotel. Quench your thirst with your favorite drink at a bar/lounge.Business, Other Amenities Free self parking is available onsite. A family-friendly Ashford hotel with an on-site pub near Channel crossingsHoliday Inn® Ashford - North A20 hotel, a 10-minute drive from the M20 motorway, is an ideal stop on route to Disneyland Paris.You can reach the ferries at Dover or the Eurotunnel at Folkestone in half an hour, or simply catch the Eurostar from Ashford International railway station, a 15-minute taxi ride from the hotel. If you fancy some fresh air, the countryside around the hotel offers walks and quaint villages to explore, notably in the nearby Kent Downs Area of Outstanding Natural Beauty. You can also shop for bargains at Ashford Designer Outlet or in Ashford town centre, both a short drive from the hotel. Business guests can make use of 8 purpose-built meeting rooms for up to 125 guests, with easy access for delegates just off the A20.At this hotel you can enjoy:- Free parking and WiFi- An on-site gym- 24-hour room service- Kids stay and eat freeTuck into tasty, filling dishes at the hotel's Orchard Restaurant, or order a beer or coffee at the bar. The traditional Hop Pickers Pub on the hotel grounds has a playground so the kids can get some exercise while you relax. There's also a terrace if you feel like a drink in the country air. Our inviting rooms have pillow menus and rural views, and some add sofa beds that are perfect for families. A convenient hotel with restaurant, free parking and close proximity to the Eurostar station at AshfordHoliday Inn® Ashford - Central hotel is only 2 miles from Ashford International Station.Regular Eurostar trains travel to Lille, Paris and Brussels, and services to Central London take just 40 minutes. There's easy access to the ferries at Dover and Folkestone via the nearby M20 motorway. Canterbury Cathedral, a World Heritage site, is only 14 miles away, and the adjacent King's Mile is lined with independent shops and charming pubs. Take the family to spot lions, tigers and gorillas on a safari-style trip through Port Lympne Reserve, or explore Leeds Castle on an island in the River Len, both within a short drive. Local businesses cluster conveniently nearby at the Orbital and Eureka business parks. You can host a wedding or an event for up to 125 guests in our 4 onsite meeting suites.At this hotel you can enjoy:- Free WiFi- Rooms with sofa beds for families- 24-hour room serviceOur comfortable rooms and suites have satellite TV and a choice of pillows to help you sleep. You can settle down to breakfast, lunch or dinner beneath the oak beams in our Bybrook Tavern, and kids stay and eat free. Watch BT Sport with a drink in the lounge, or get some fresh air in the garden. Europe's your oyster with Premier Inn Hotel Ashford Central, just minutes from the Ashford International high-speed rail link to London, Paris and beyond. And if you're staying closer to home, you'll be well placed for business and leisure destinations around the South East, too. Stroll around Canterbury's historic streets, or discover Folkestone's sea-faring past at the harbour. Spot a bargain at Ashford Market, or indulge in some retail therapy at Ashford Designer Outlet village. Then head back for a tasty meal in our restaurant and unwind in your spacious room and huge comfy bed. This charming hotel is set in Ashford. Guests will enjoy a peaceful and calm stay at Bircholt Cottage as it counts with a total of 2 guests rooms. Guests will not be bothered during their stay, as this is not a pet-friendly accommodation. All 179 rooms have stunning decor, comfy duvets, flat screen TV's, individually controlled air-con and all the quality expected of a four star hotel. Horizon Wine Bar and Restaurant serves a brasserie style menu using local ingredients. The Leisure and Spa facilities include a 20m indoor pool, sauna, aroma steam room and 6 beauty treatment rooms. Free WIFI in all rooms. With a stay at Eastwell Manor, Champneys Hotel & Spa in Ashford, you'll be within a 15-minute drive of Ashford Designer Outlet and Ashford Golf Club. This 4-star hotel is 11 mi (17.7 km) from Port Lympne Wild Animal Park and Gardens and 15.1 mi (24.2 km) from Leeds Castle. With a stay at Plumpton House in Ashford, you'll be within a 15-minute drive of Ashford Designer Outlet and Port Lympne Wild Animal Park and Gardens. This bed & breakfast is 11.8 mi (19 km) from Eurotunnel Folkestone Terminal and 13.8 mi (22.2 km) from Canterbury Christ Church University. 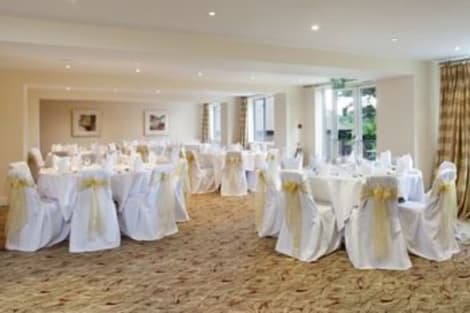 Located in Ashford, The Flying Horse Inn is close to Ashford Golf Club and Ashford Museum Located in Ashford, The Flying Horse Inn is close to Ashford Golf Club and Ashford Museum. This 4-star inn is within the vicinity of Willesborough Windmill and Godinton House and Gardens.Rooms Bathrooms with shower/tub combinations are provided. Make use of convenient amenities such as complimentary wireless Internet access, a picnic area, and barbecue grills.Dining Enjoy a satisfying meal at a restaurant serving guests of The Flying Horse Inn. Quench your thirst with your favorite drink at a bar/lounge.Business, Other Amenities Free self parking is available onsite. The thriving market town of Ashford in Kent serves as a great base, whether you're looking to explore the local area or simply want a convenient stopping-off point before catching a high-speed Eurostar service from Ashford International railway station. There are plenty of quality hotels in Ashford, so finding accommodation to suit your requirements shouldn't be a problem. Ashford's railway terminus has certainly helped to put the town on the map. It's highly accessible, being just 38 minutes from central London and less than two hours from Paris and Brussels. Godinton House and Gardens to the north-west of Ashford date back to the Jacobean period. Pay a visit to enjoy a tour of the property and find time for a relaxed stroll through the grounds. Ashford Borough Museum is close to the town centre, along with the beautiful St Mary the Virgin Church. Take a tour of the restored Willesborough Windmill, just a few miles from the centre of Ashford, to discover all about the history of milling on the site. If you're keen to find a bargain in the sales, or simply fancy a bit of window shopping, pay a visit to the nearby Ashford Designer Outlet. You'll find scores of the world's leading brands represented, along with numerous restaurants and cafés. County Square Shopping Centre in the middle of Ashford is also worth visiting, along with the numerous independent shops and boutiques dotted around the town. A large number of Ashford hotels offer an in-house dining option, but there are also plenty of cafés, pubs and restaurants in the area to choose from. Amici Restaurant on North Street serves a wide selection of Italian favourites, while Aji Japanese Restaurant on New Rents is known for its excellent sushi. Willesborough Cafe & Pie N Mash Shop to the east of the centre is a popular spot serving quality food that represents great value for money. There's also a wide selection of traditional pubs in the local area including The Swan on Tufton Street, County Hotel on High Street and The George Hotel a few doors further down.